If you forgot your VOIP Line password or if you want to change your VOIP Line password you can use our “Reset” button. Here is how you can reset your VOIP Line password in your DoorVaani account. 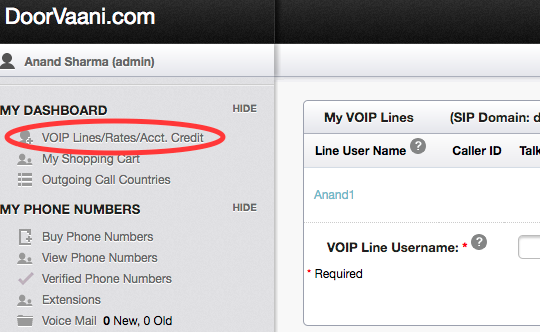 Menu item to click on to reach “My VOIP Lines” page. Once you are on the “My VOIP Lines” pages, please locate the “Password” column and click on the “Reset” button of your VOIP Line. This will take you to the “Reset VOIP Line Password” page. Please enter your desired new password and confirm password on the “Reset VOIP Line Password” page and then submit the page.